We can't believe Easter is just six days away! We love Easter, y'all! Between dying eggs and putting together baskets full of treats, to bright spring dresses and cute little bonnets...what's not to love?! 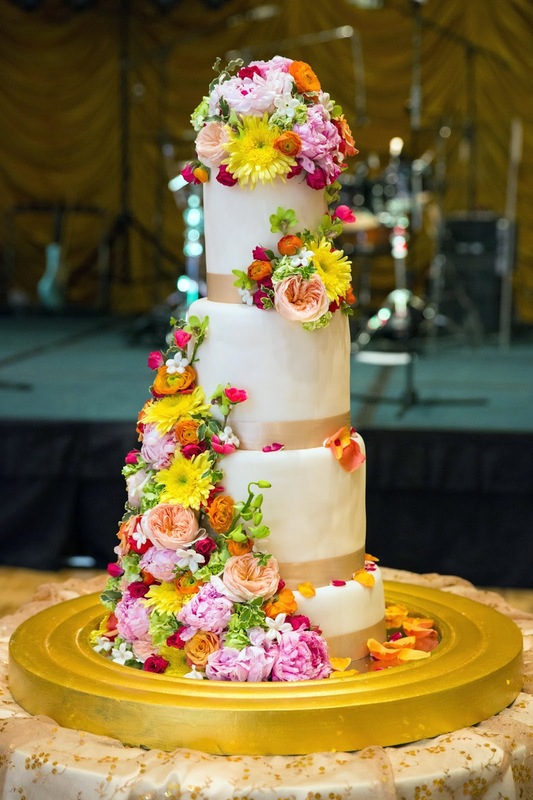 In celebration of our favorite spring holiday, we've rounded up some of our favorite Easter themed birthdays we've done over the past year. 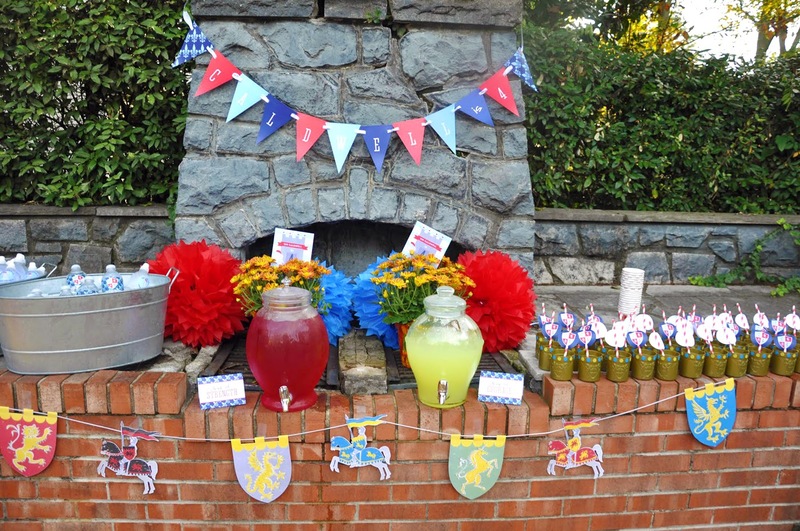 From a watercolor pink bunny birthday, to a gingham egg hunt, we've done some really bright and festive parties! 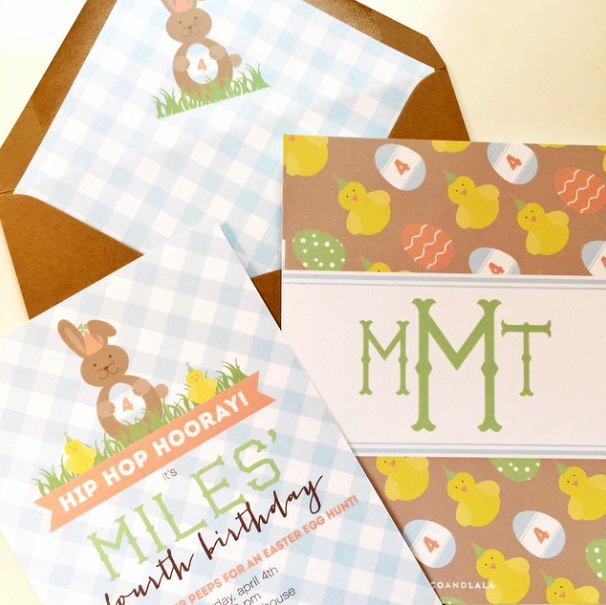 We've combined these cute invitations with some super fun and easy party ideas to help put some pop in your bunny hop this weekend!! 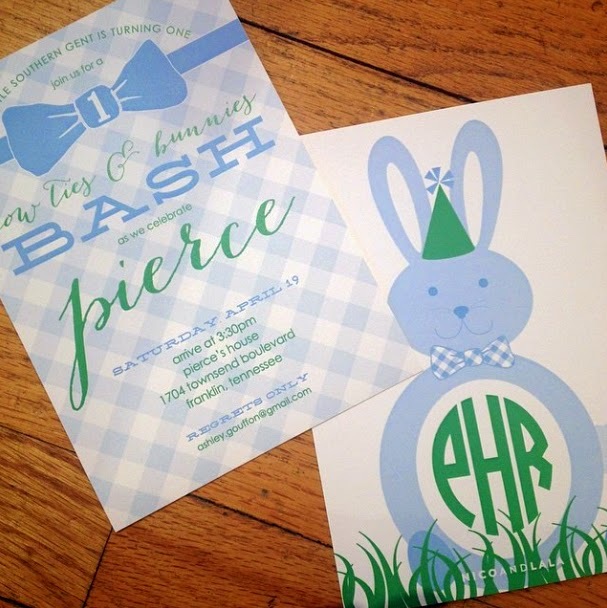 Miles' birthday invitation has it all...Easter eggs, gingham, chicks (wearing party hats), and the Easter bunny! 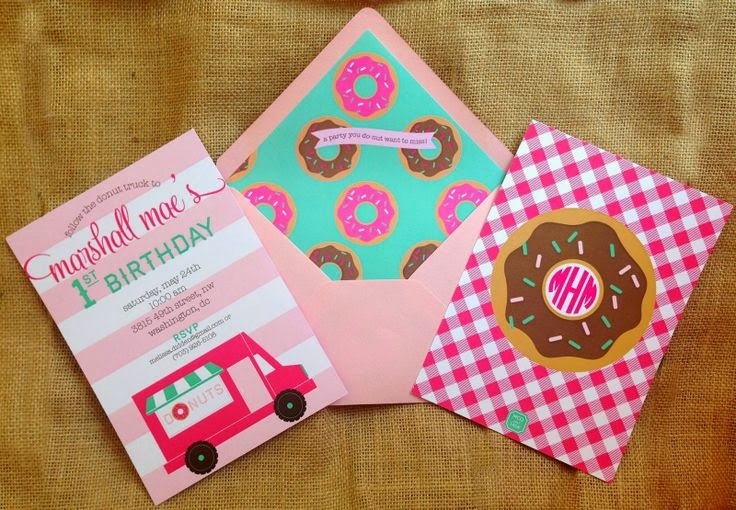 Could this invitation get any cuter? The perfect Easter birthday theme for a Southern gent...bow tie and bunny bash! Pink and green for a bunny brunch and egg hunt?! We're in for these sweet pair of twins' birthday!! 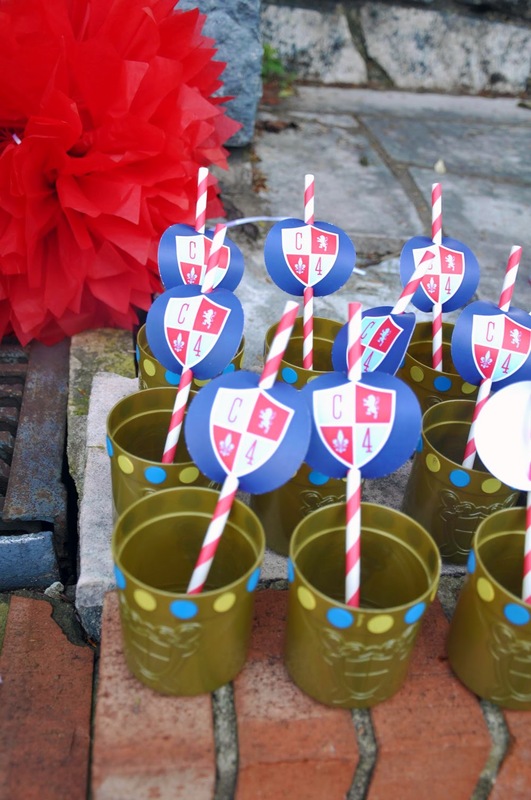 Grace's mom wanted to create something really pretty and vintage-inspired for her second birthday party, without being too "over the top" Easter. So we paired a watercolor pink background with floral accents and a bright white bunny! These watercolor Easter eggs remind us of Grace's sweet invitation! 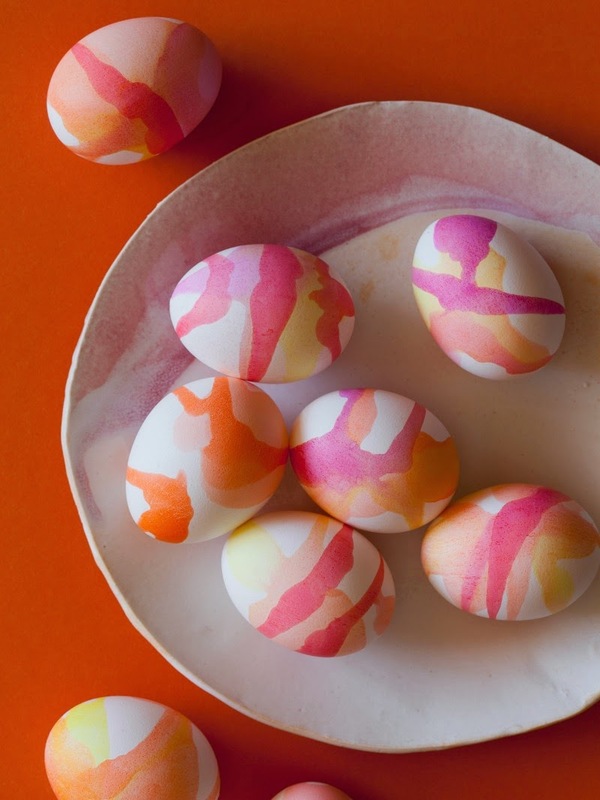 They're both beautiful and easy to make; now that's an egg decoration we can attempt! For the full DIY instructions, visit Spoon Fork Bacon. 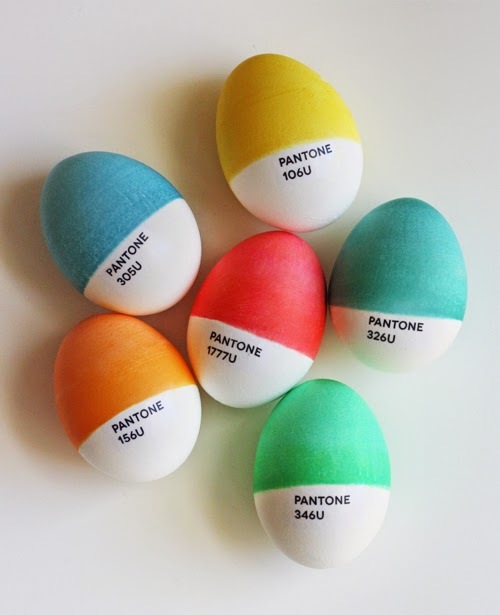 Speaking of Easter egg decorating ideas...our team uses our Pantone books just about every single day, so we can't help but LOVE these Pantone Easter eggs! To make your own, see the complete DIY on How About Orange. 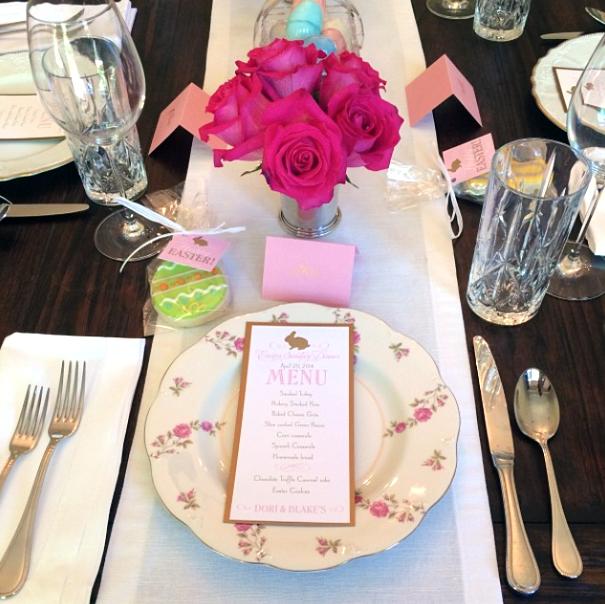 No bunny brunch is complete without an Easter themed tablescape. 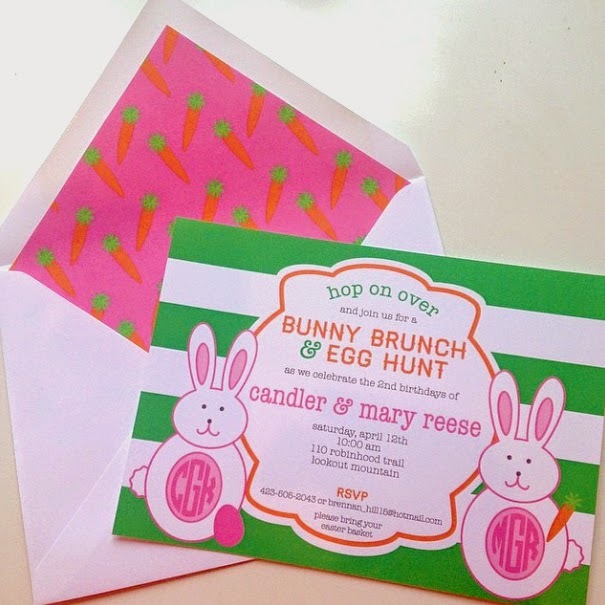 Last year, we helped one our fabulous friend Dori (of The Social Office) design some swanky menus, place cards, and favor tags for her Easter brunch. We love the sweet Easter egg shaped cookie at each place! 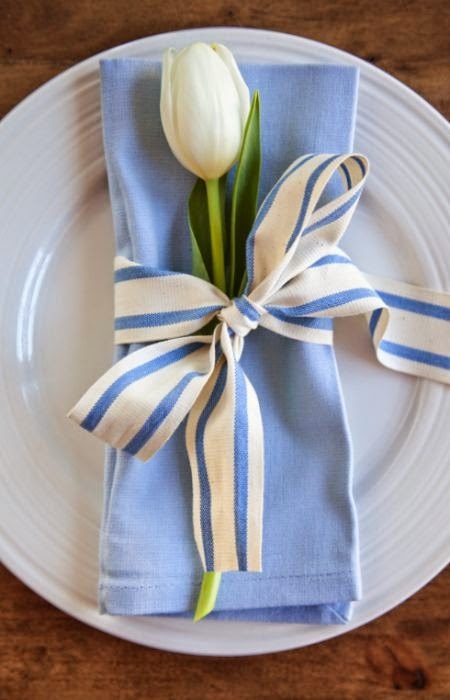 No brunch is complete without using tulips in some way! 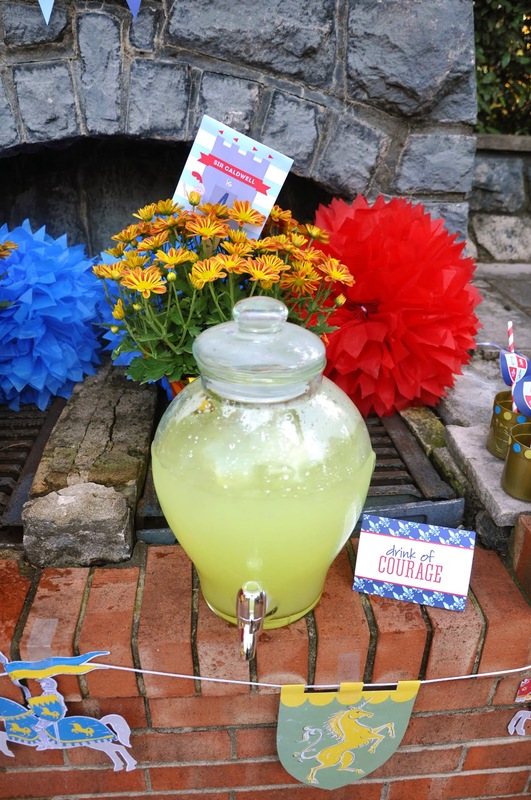 We love the idea of placing one at each seat. 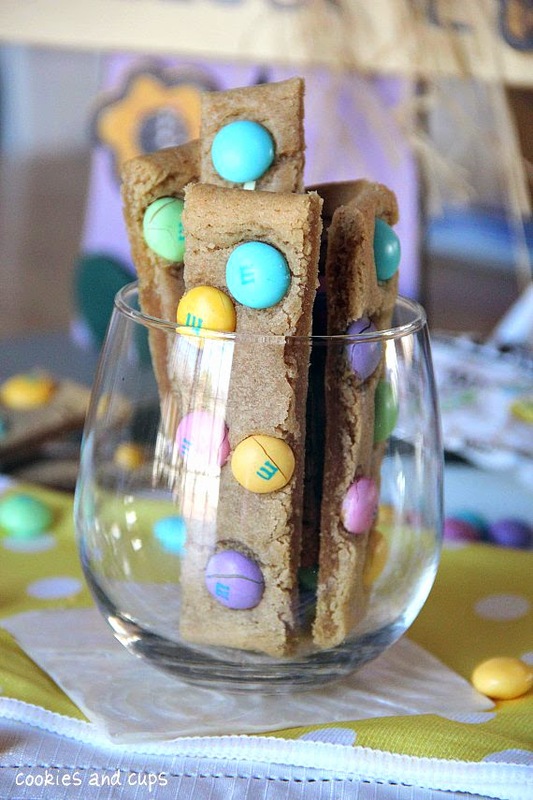 These cookie sticks (complete with Easter colored M&M's) would be the perfect sweet treat for a bunny brunch!! 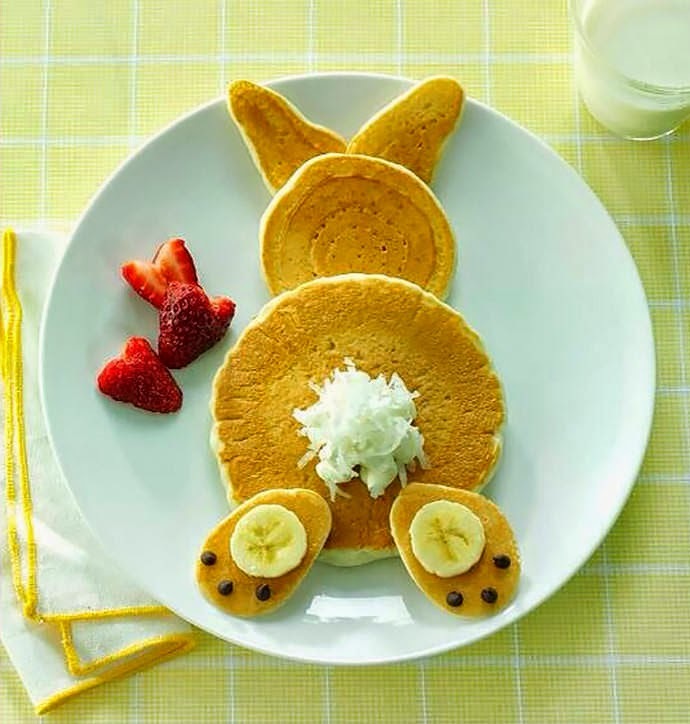 These bunny bum pancakes are a MUST! 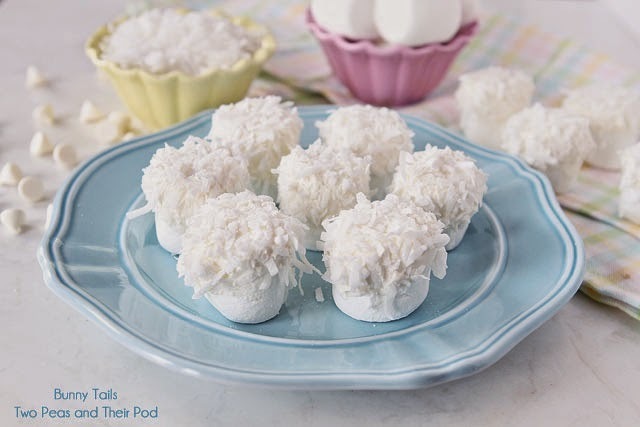 Three ingredients (marshmallows, coconut, and white chocolate) and oh so cute!! Visit Two Peas and Their Pod for the full bunny tail DIY. 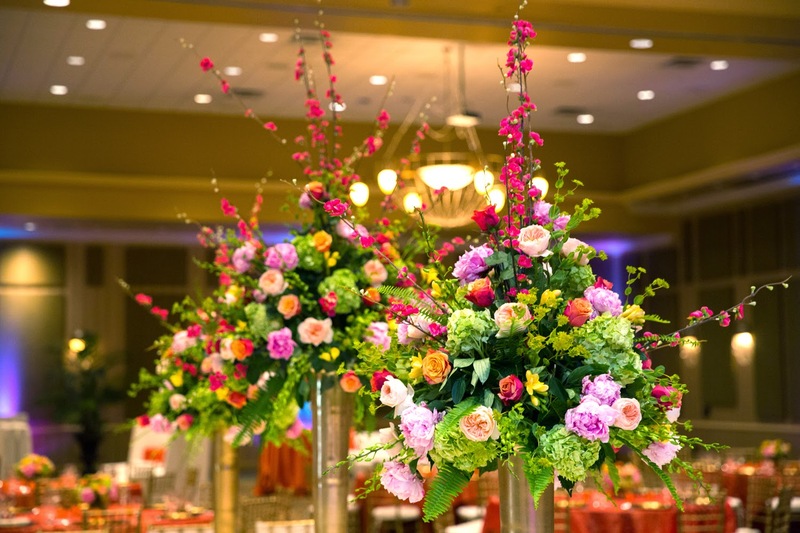 There is nothing we appreciate more than a bright pop of color...especially when it comes to weddings! 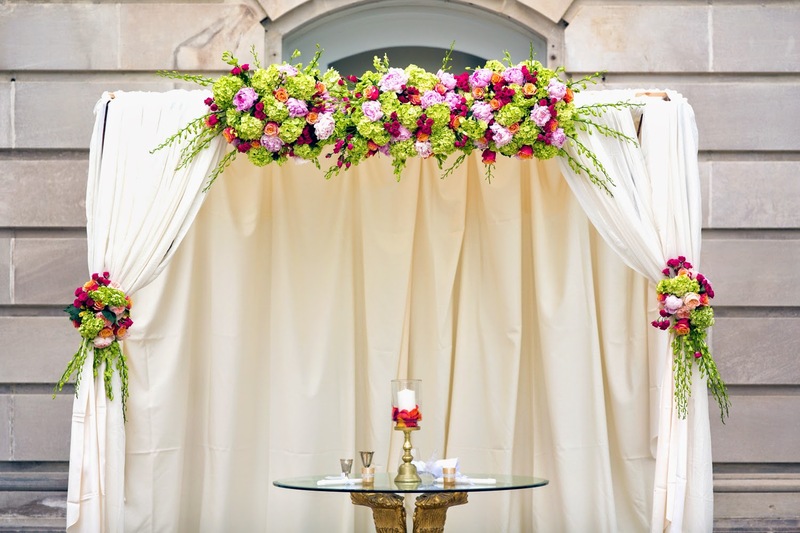 Jessie and Logan made a "pop of color" the main focus of their wedding, as a vibrant color palette dominated their summer wedding decor. 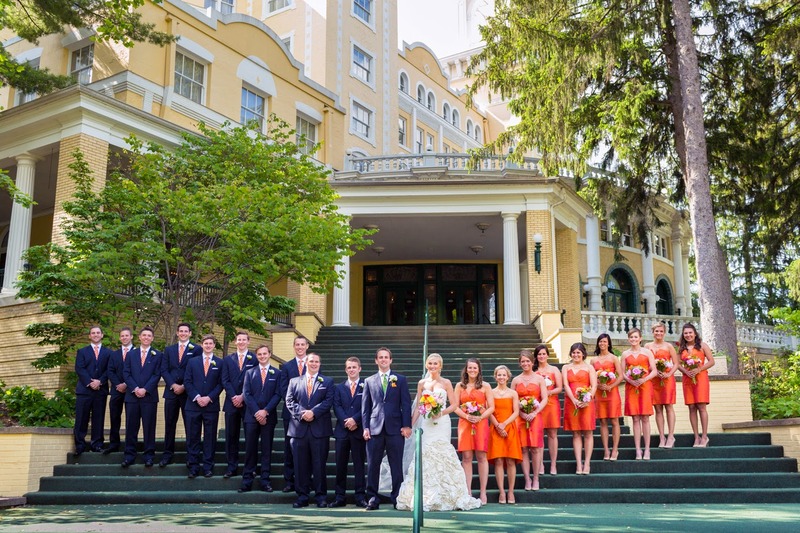 Held at the historic West Baden Hotel in Southern Indiana, this grand resort provided a fabulous backdrop for their elegant wedding festivities. 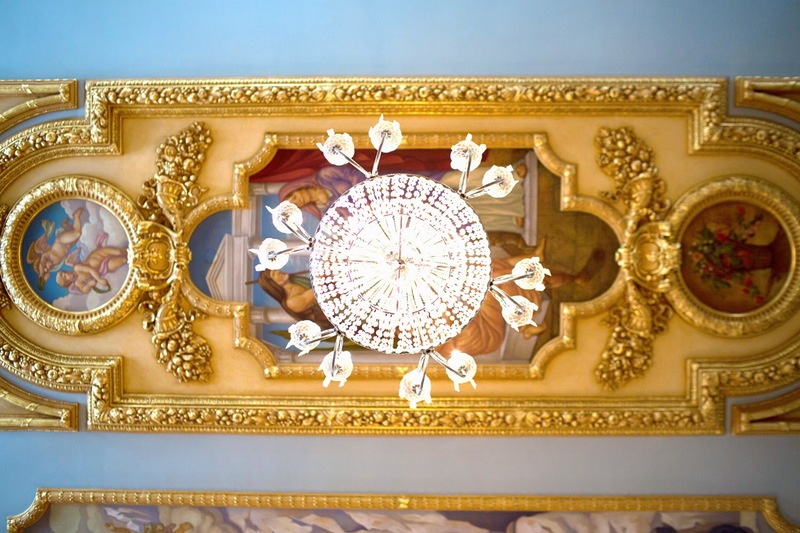 Originally built in the 1800's, the resort's design was inspired by the grand European spas and resorts of the early 1900's...very swanky! 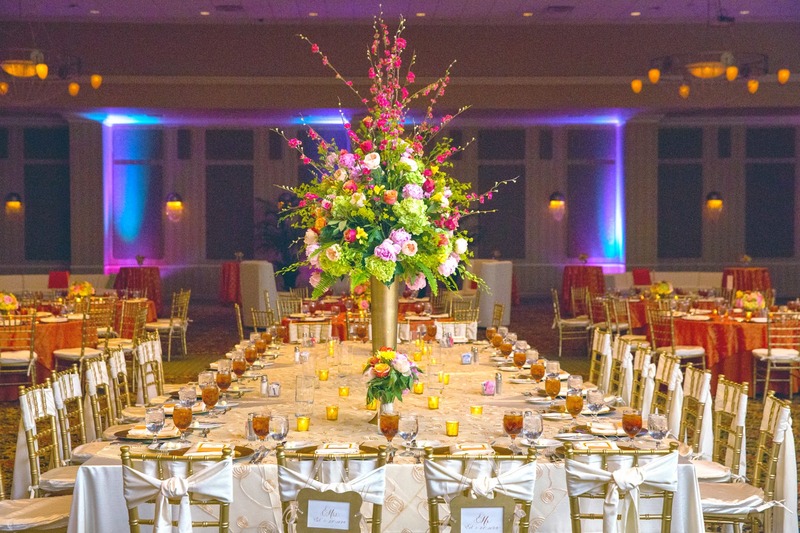 Combining this elegant location with Jessie and Logan's vibrant wedding colors created one unforgettable night. 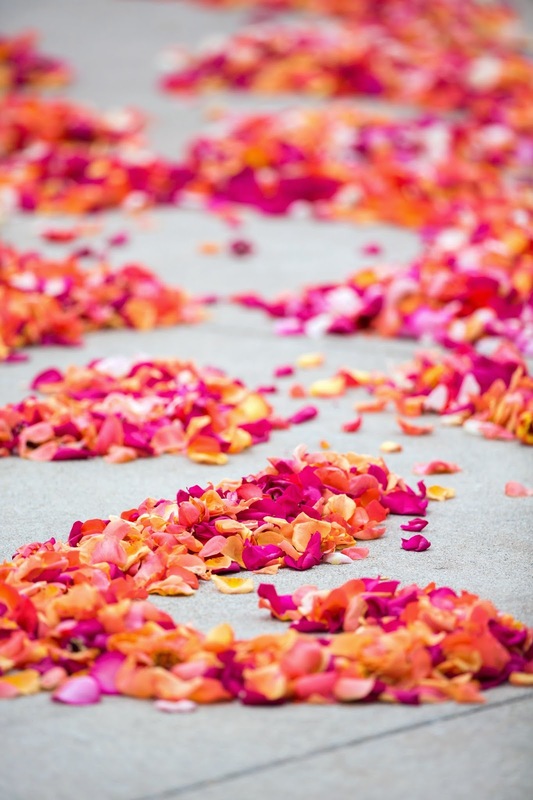 Join us as we share their colorful wedding day! 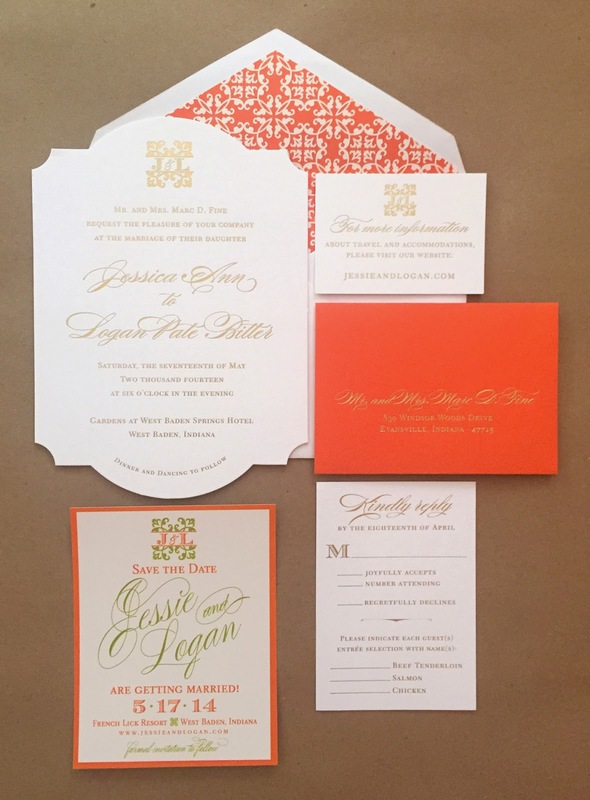 For Jessie and Logan's save the dates, we wanted to highlight their custom wedding monogram and wedding colors: a juicy orange and lime green! 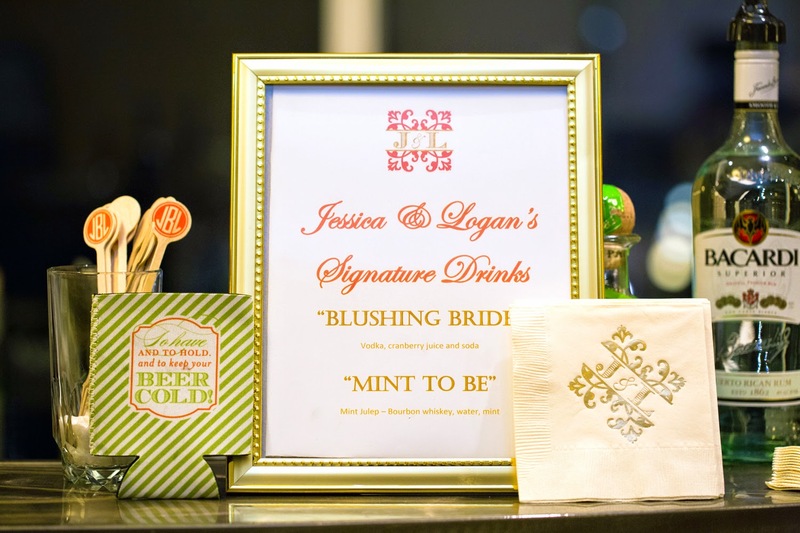 Jessie and Logan's wedding invitations were the perfect mix of traditional and fun. 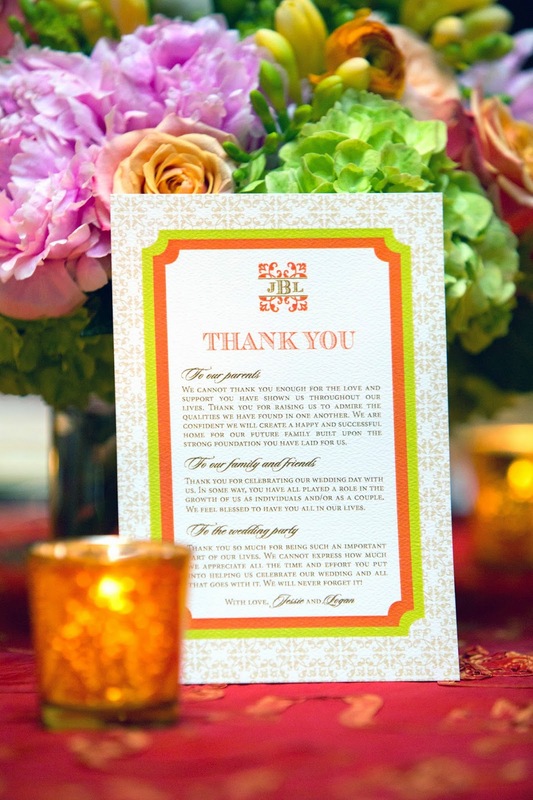 The invitation itself was printed on ivory paper with gold foil stamping, which gave a nod to traditional printing. 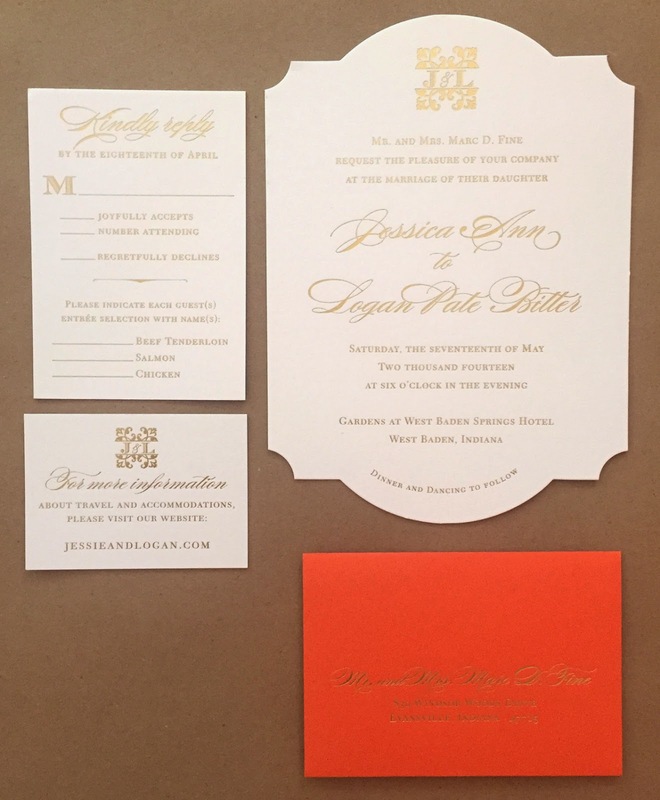 To give it a bright pop of color, the reply card envelope and envelope liner were both orange. 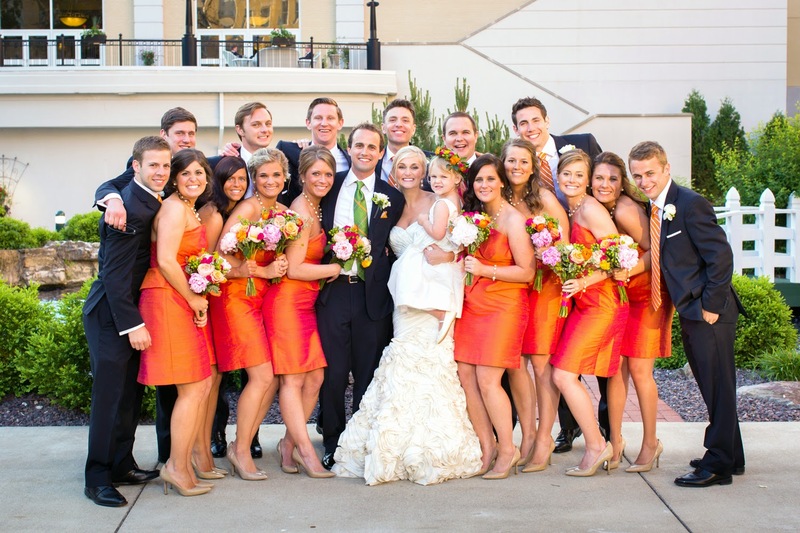 We absolutely love orange and gold paired together; it's very Tory Burch and fabulous! 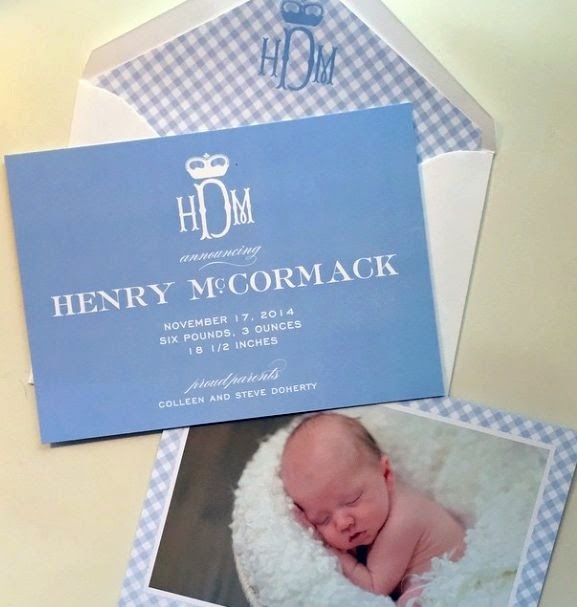 Another one of our favorite features of their invitation? 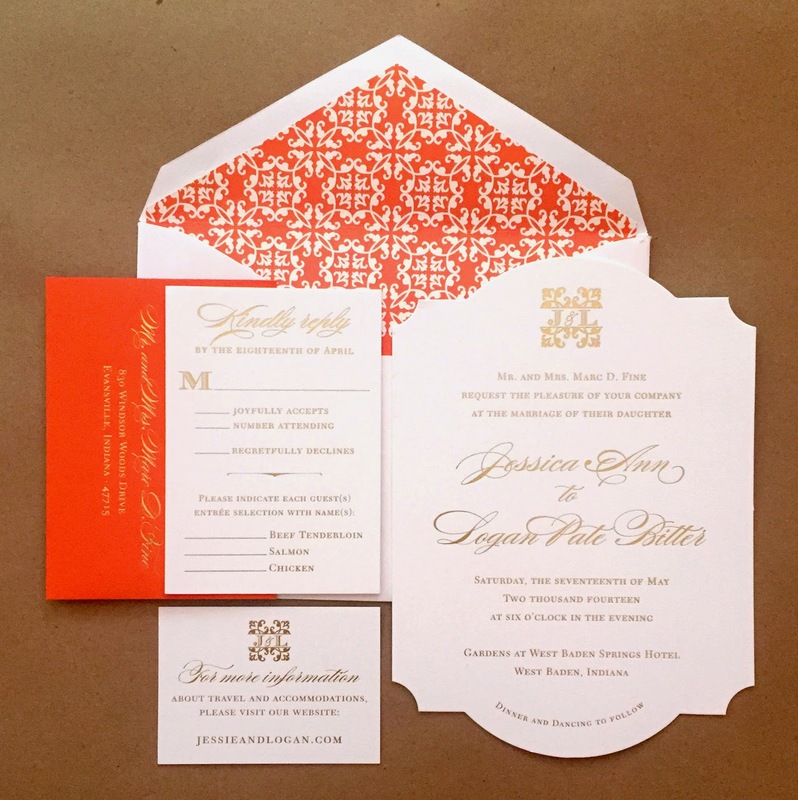 The modern die-cut shape of the invite! 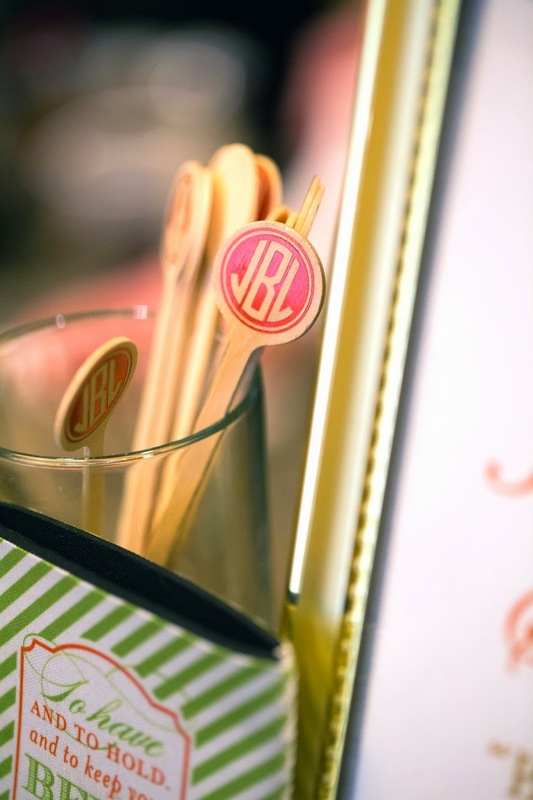 We also love how prominently the couple's custom wedding monogram was featured on both their invitation and website card. 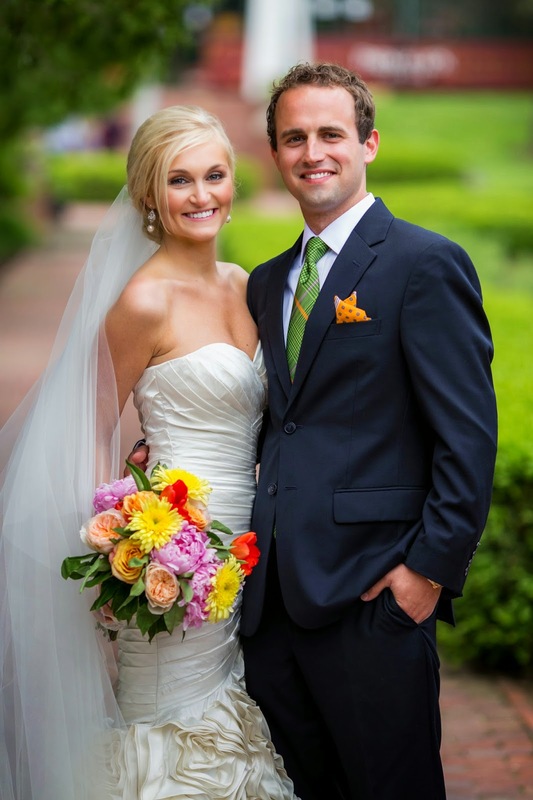 Congrats to the happy (and adorable) couple, Jessie and Logan! 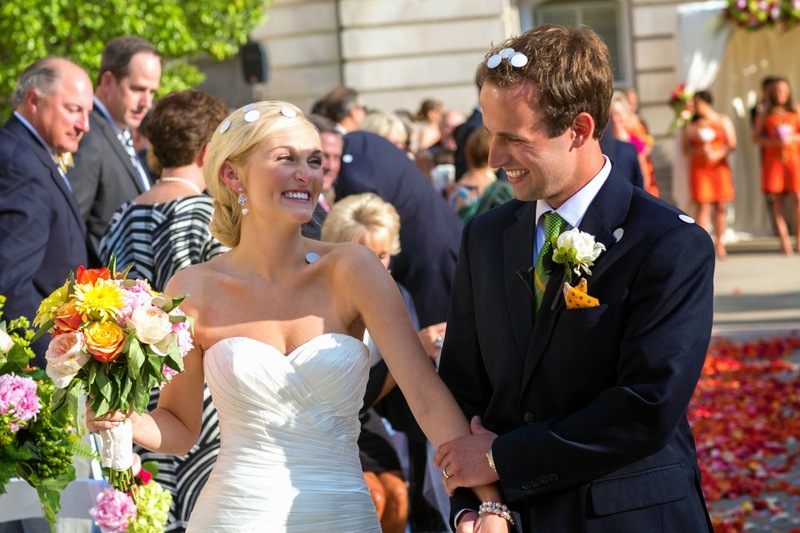 We're so happy we got to be part of your special day! 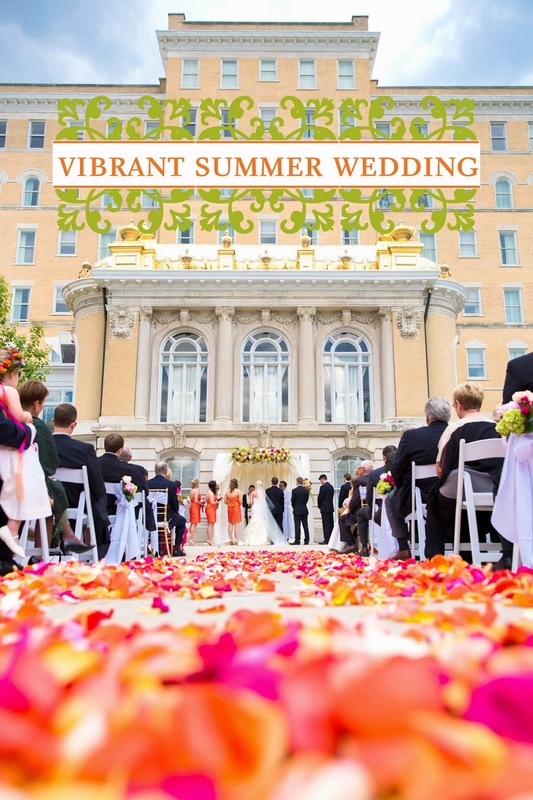 To see more of Jessie and Logan's vibrant summer wedding, visit their gallery page over on our website! Happy spring, y'all! We couldn't be happier to see the seasons change after a long, harsh winter in the city. Even though spring apparently means it still snows...at least in Chicago. With the official arrival of spring comes many things: bright manicures, iced coffee, white jeans, and fun patterns for spring. We recently discussed our (and our customers) love of florals this time of year, but we also can't get enough of gingham! This classically preppy pattern pairs well with just about every color and other pattern under the sun. It's always one of our favorite patterns to use when designing (and getting dressed), but especially with the arrival of spring. Check out the different ways we've been using this preppy pattern. 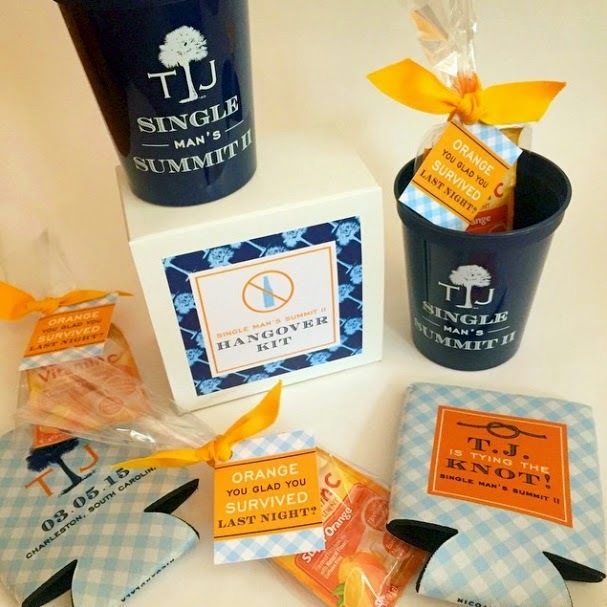 Y'all know we specialize in custom bachelorette parties, but bachelors like party swag too. 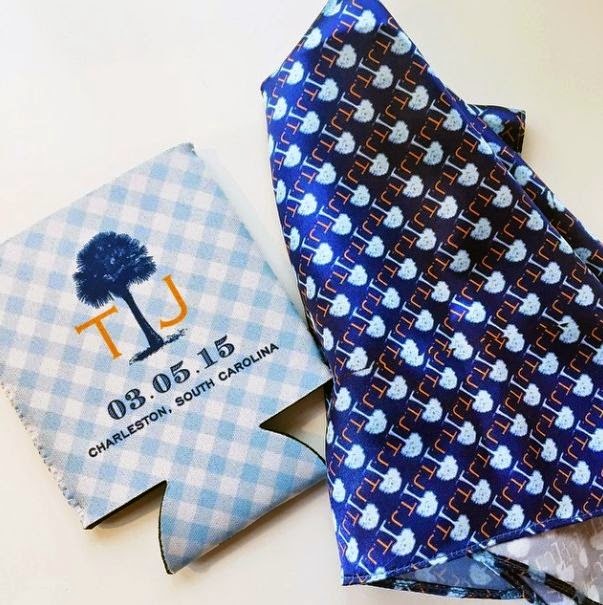 T.J. and his friends recently headed down to Charleston to celebrate his upcoming wedding, so we created some swag (heavy on the gingham) to welcome his guests! T.J.'s bride-to-be even had custom pocket squares created out of his bachelor party monogram to match the rest of his bachelor swag. 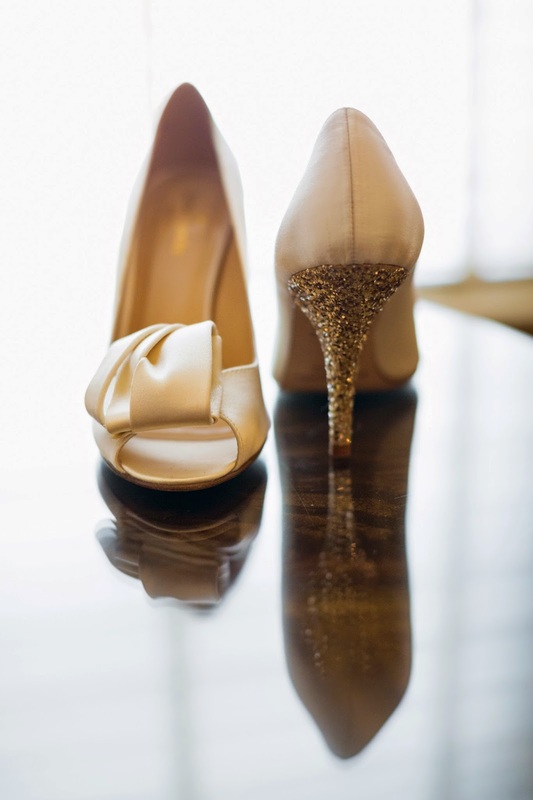 Talk about some Southern charm!! In bachelorette hangover kits, we include makeup wipes, along with Advil, saltines, and gum. But we didn't think these Southern gents would get much use out of the makeup wipes, so we switched them out for some EmergenC. Which ended up matching perfectly with the blue and orange swag! 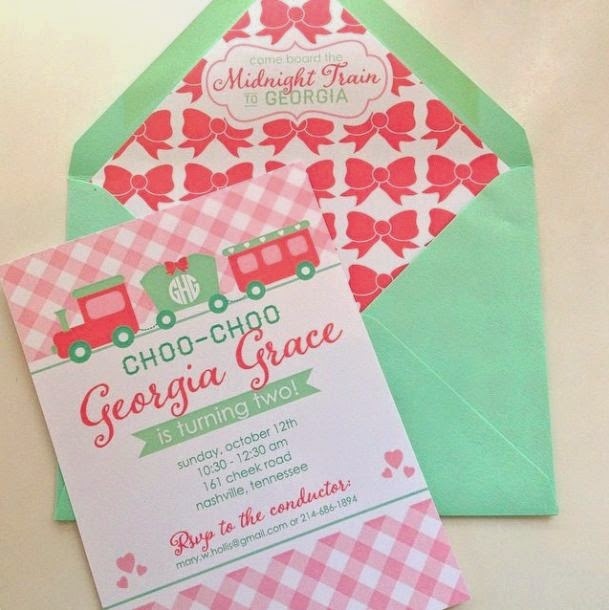 We love gingham for little girls' parties!! It's the perfect pattern to pair with both stripes and bows, and looks great in pink! 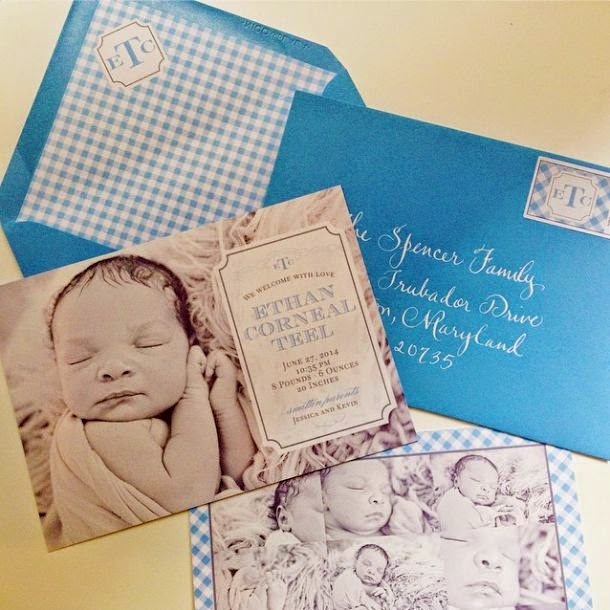 Gingham is also the perfect preppy accent for baby boy birth announcements. Now onto the gingham items we're currently coveting for spring! We LOVE this gingham midi dress for spring! Meghan on our team has been wanting this dress since last summer, and now that it's on sale ($37, originally $92) she thinks its a must purchase! Find at ASOS. 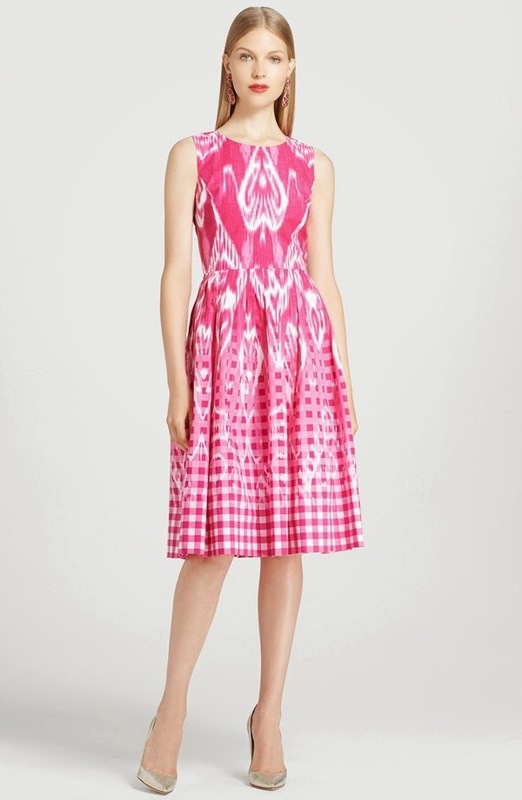 This hot pink little number by Oscar de la Renta has a spot in our dream closets. Combining two of our favorite patterns (gingham and ikat) and in one of our favorite colors...this is one fabulous dress. This J.Crew bikini combines two of our favorites: gingham and seersucker. And in coral, how can we resist? The only thing better than gingham is large gingham...in hot pink! This Vineyard Vine shirt would be perfect layered with a sweater and paired with colored jeans for the perfect spring outfit! 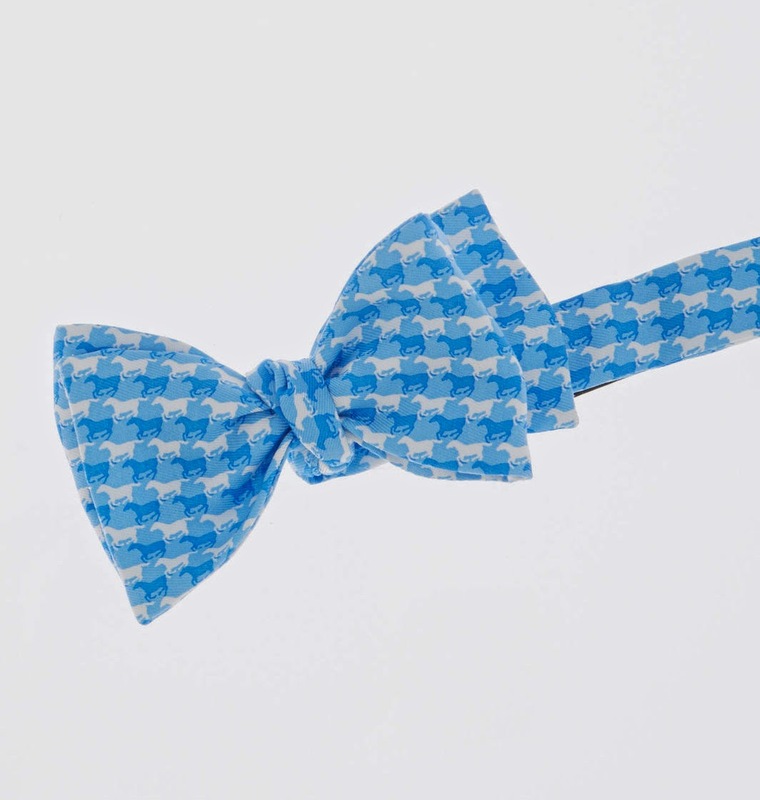 And one for the guys....yes this is a Vineyard Vines gingham bowtie. And yes, the gingham pattern is made out of horses!! Perfect for the Derby! 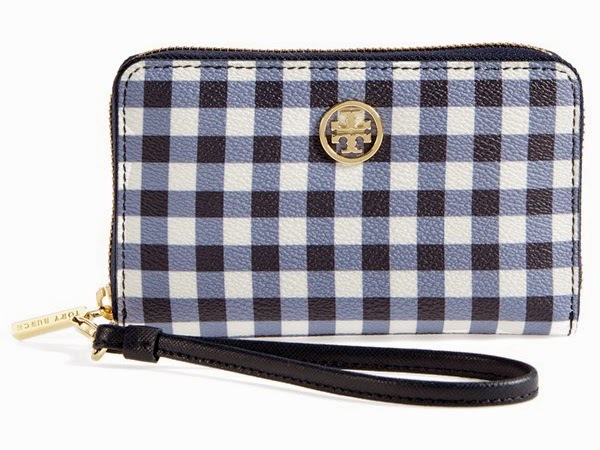 Last but certainly not least, we love this little wallet by Tory Burch. Big enough to fit your phone and the essentials, while still giving your outfit a fun pop of navy and white gingham. Happy (official) first week of spring!! Hear Ye, Hear Ye...It's a Knight Birthday! 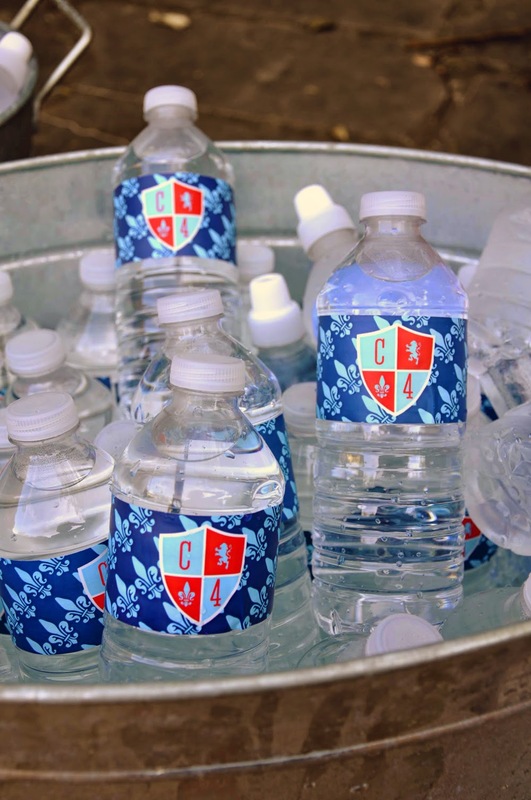 We're celebrating the start of the weekend by sharing a chivalrous (and fun!) birthday celebration. 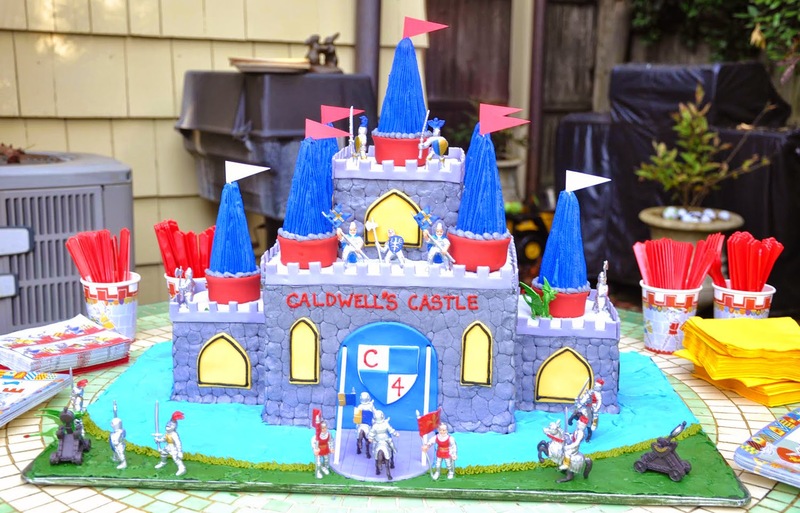 Birthday boy Caldwell has done some really awesome past birthday parties with us! For his second birthday, we created an adorable planes, trains, and automobiles party, and last year we helped with his construction birthday! But this year was special. After showing great bravery and extraordinary valor, he was knighted! 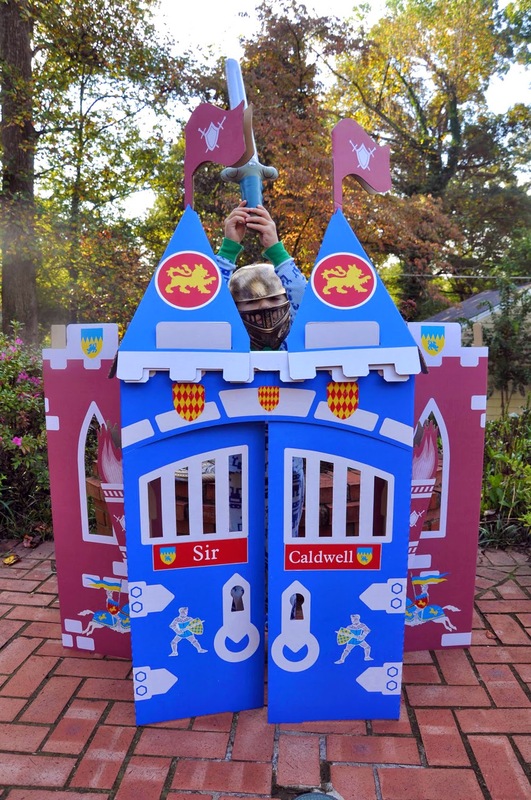 So to celebrate his fourth birthday, we went all out with his knight birthday celebration. 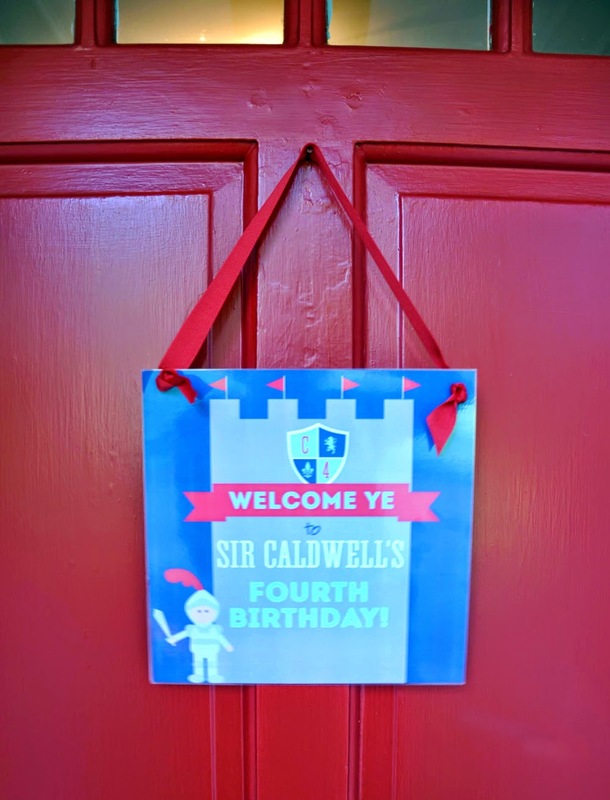 Calling all brave knights of the court and fairest ladies...join us for a royal celebration, as Sir Caldwell turns four! 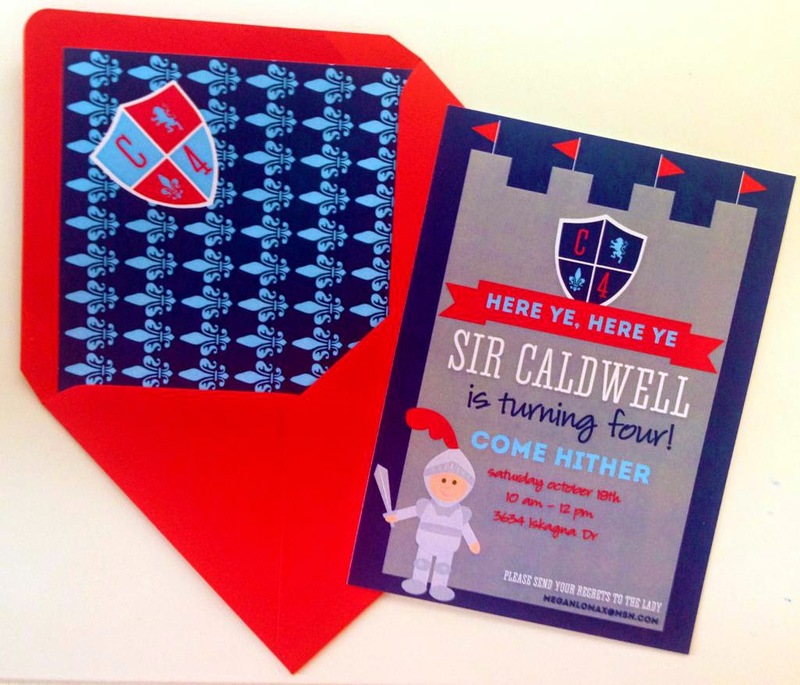 Like any great knight, Sir Caldwell was given his own "coat of arms" which was included on his invitation, and the envelope liner! 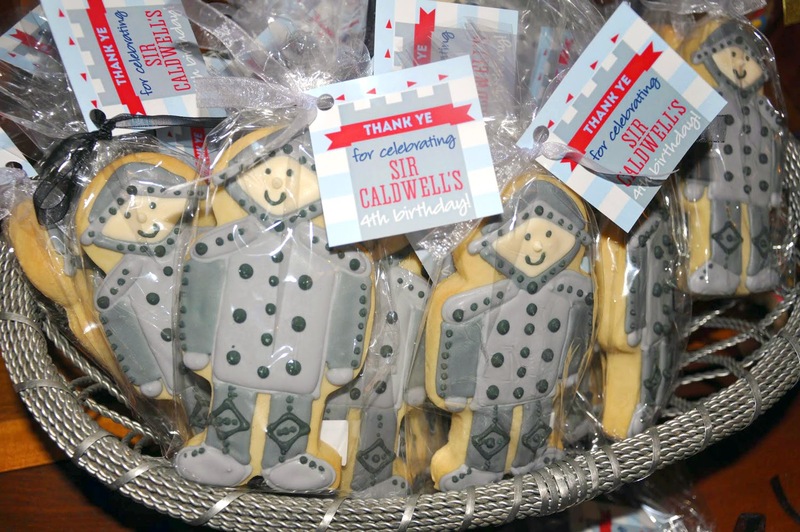 We love Caldwell's party favors...knight shaped cookies tied with a ribbon and finished with a cute little favor tag! Happy Birthday, Caldwell!! 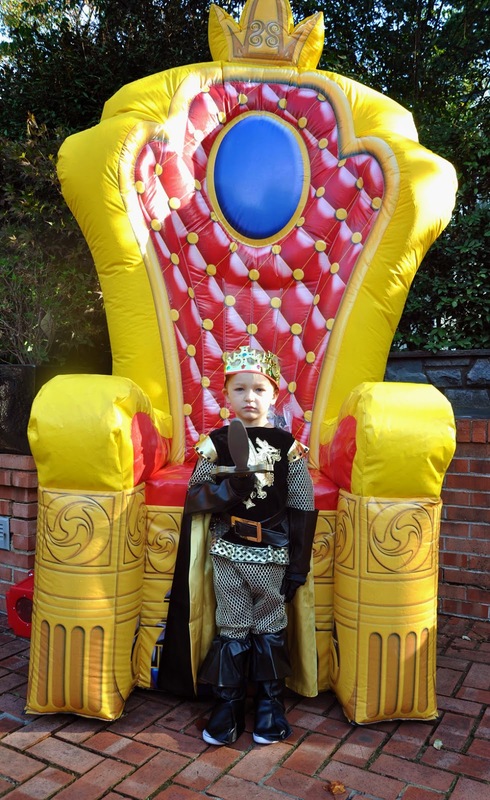 Hope you had a royally awesome time at your 4th birthday! Wishing y'all a great weekend!